The lowdown: Evergreen super-sleuth Sherlock Holmes gets the revisionist treatment once more in Mr. Holmes. But, in the hands of star Ian McKellen and director Bill Condon, it’s a beautifully crafted gem. Playing games with the legend, this take on an aged Holmes is warm, intelligent and affecting. The full verdict: 1947, and a 93 year old Sherlock Holmes is enduring retirement in the South Downs and tending to his bees (as per Holmes tale His Last Bow), irritating his housekeeper Mrs. Munro (Linney) and delighting her young son Roger (Parker). The last that’s left of his old social circle, Holmes has one more case to crack: the mystery that forced him into retirement. Senility now ravaging his mind, he must employ memory triggers to recall what caused him to flee into hermitage. Based on Mitch Cullin’s book A Slight Trick of the Mind, Mr. Holmes is a treat. Carefully paced, much like its leading character, refreshing it is to watch a film that allows the story to unfold slowly, flashing back and forth through time to piece together memory fragments and reveal what haunts Holmes’ long, weathered face. Now-expected pricking of famous trivia is present and correct. On an excursion to post-war Hiroshima to collect a rare plant known for memory restoring properties, the mother of his Japanese host is disappointed to learn the deerstalker was a bit of creative license on the illustrator’s part. Holmes’s address is actually opposite 221B Baker Street, so as to avoid obsessive fans. Room is also made for the opium needle, turned to here in a moment of desperation. Holmes’ last case, involving a woman (Morahan) who may be plotting her husband’s murder after a double tragedy drives her mad, forms the film’s backbone, deftly woven in alongside Holmes’ self-imposed exile and his trip to Japan. And like all great detective stories, the seemingly inconsequential Japan subplot ties into the greater mystery, in a way both unexpected and rewarding. McKellen and Condon paired previously for 1998’s excellent Gods and Monsters, the actor playing Frankenstein director James Whale, another exceptional man robbed of his powers through age. McKellen was Oscar nominated there and deserves to be so again here (and a win would be nice this time). Aided by superb aging make-up his performance is another masterclass in geniality, superciliousness, mischievousness and sorrow. 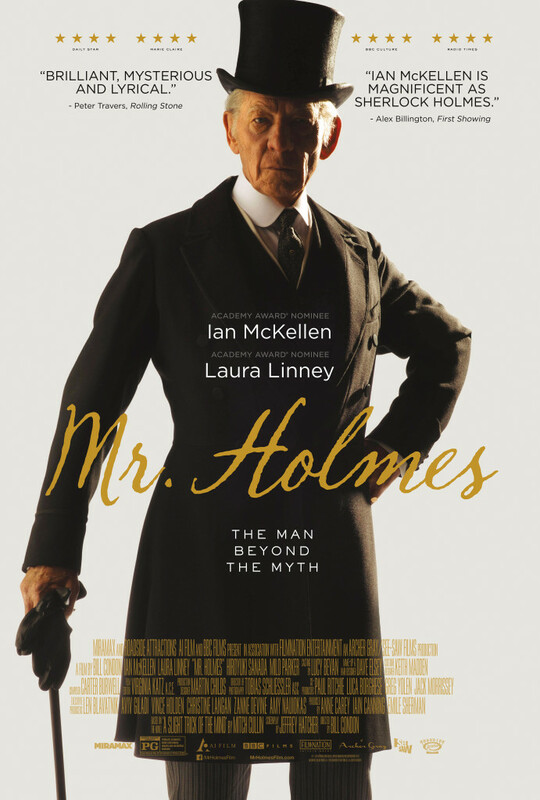 Laura Linney (getting away with a West Country accent) delivers a typically accomplished turn, grieving a husband lost in the war and worrying Roger’s sense of adventure with Holmes will place him on the same path as his father. 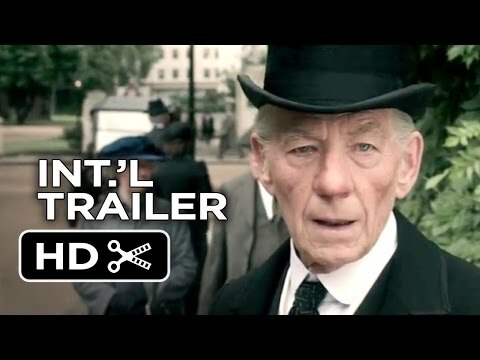 Parker holds his own against both McKellen and Linney, infectiously enthusiastic when demanding Holmes do the “thing” – i.e. deduce someone’s profession, predicament or recent doings based solely on looking them over – and keeping the film buoyant where melancholy could have choked it. Dr. Watson is glimpsed in flashbacks but often referred to by a regretful Holmes, the friendship modern adaptations sometimes forget to include here fully realised in the detective’s rheumy eyes. Condon also makes room for a wonderfully realised scene when Holmes visits a cinema showing an adaptation of a past adventure. Portraying him on the silver screen is Nicholas Rowe, Young Sherlock Holmes way back in 1985, time once more playing tricks. It’s a delightful moment in a thoroughly delightful film.